As some of you know, I just got back from a three week trip to Asia. 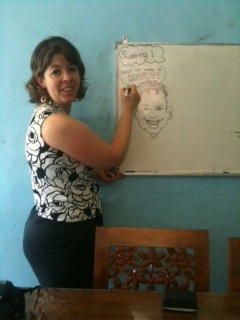 I was in Singapore to do some chalkboard design work and then in Bali for my friend’s wedding. Bali is an AMAZING, magical place! People there are so friendly, want to know all about you and are willing to barter with you to give you a good price. Bali folks are amazing and talented! It’s an arts and crafts haven. If you want to buy some cool wood sculptures, you go to this town called MAS. Further down you go to CELUK to buy silver from the silversmiths and then for soap stone sculpture, a town called Batabulan. My friend Theresa and I went to this family’s house (yup – you just walk right on in!) and started bartering for some nice pieces of silver jewelery. 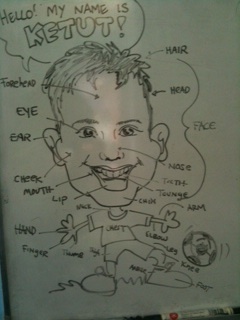 The man’s son was very cute and I noticed on their drawing board that he was trying to learn English. 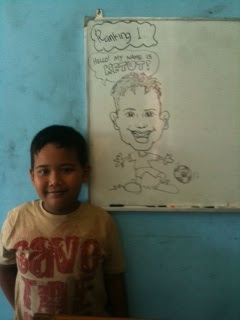 So, I offered to draw him in his own home and teach him English! I have to say, making him happy was one of the highlights of my trip!